“Hello Julia, I wanted to message you, although it is quite difficult to find the words to accurately convey the beauty of the experience you created for me yesterday. You were immediately welcoming, but more than that, I felt a connection with you that is rare on a first meeting with someone. Your confidence and understanding of what you do are certainly contributing factors. The atmosphere of calm that you create, and the way that you listened and took a genuine interest in what I said before the massage began, quickly produced a feeling of mutual trust – not always possible on meeting a new therapist for the first time. After my back injury I hadn’t trusted anyone to touch my back for a very long time – over 10 years – because the trauma of that injury was so severe – so being able to place myself in your hands with complete trust, allowed me to start easing away from that state of hyper-vigilance that I normally inhabit. I love the unpredictable nature of lomi lomi, being unable to map strokes was a definite aid to relaxation and the moves between my body and the couch were lovely. It lived up to all my expectations and more. I was impressed that you discovered a couple of points of tension that most therapists never locate, or pass over superficially, especially the small joint to the left of the lumbar spine, which I had not fully realised was still not quite recovered from an old back injury that I sustained years ago. Finding that spot just increased my level of trust in your intuition and abilities 1000 fold. Then following a massage, it is common for therapists to move the client out – relatively quickly – ready for the next fee-paying customer. The unhurried, friendly and interesting conversation we had after my massage was such a contrast to that, and a lovely way to gently come back to normality after the deep relaxation (rarely possible for me) of lomi lomi. At various times throughout the massage I could feel energy flowing through your hands into my body and at other times heat/power. You spent far more time with me than the allotted 2 hours, I really value that – thank you – the conversation before and after the massage just made the whole experience more personal. I can’t even begin to describe the value and power of your hand-to-hand contact – so I’ll just say a big big thank you”. 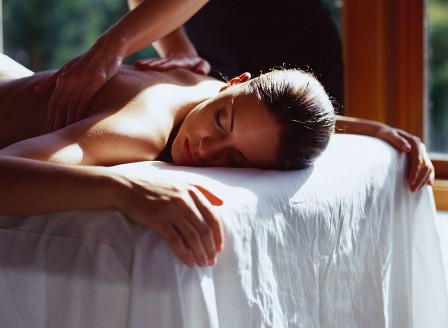 “I have just had my first lomi lomi massage. Julia is an excellent therapist. I felt totally at ease and relaxed and felt immediately that I was in expert, caring and very professional hands. The therapy was wonderful and I have already booked another. Very highly recommended”. “I have had massages now for over 35 years and Julies massage is one of the very best. I have no hesitation in recommending her”.